CATHOLIC GIFT SHOP LTD - All Creatures Great & Small Porcelain Cross Gift Set. All Creatures Great & Small Porcelain Cross Gift Set. > Porcelain cross all creatures great & small comes with with hanger & stand, 14 cm / 5 1/2 inches tall. 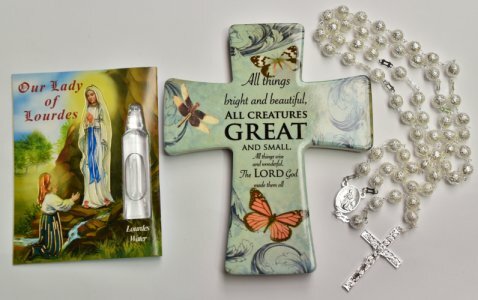 > Our Lady of Lourdes Prayer Card with Lourdes Water Vial. > Silver Lourdes rosary beads, the centrepiece depicts the apparitions on one side and on the other side their is a depiction of Bernadette. This rosary is approx 19 inches long.